A Masters win that was years in the making. A remarkable comeback, both for Tiger Woods and Nike, in the wake of scandals plaguing their public images. While Sunday’s win was not Woods’ first at the Masters, it was his first in more than a decade. The victory was marked by a memorable embrace with both of his children in their first trip to Augusta. Spectators quickly took notice that, 22 years prior, Tiger embraced his father in the same spot after winning his first Masters. The emotional moment grabbed most spectators by the heart strings. It was easy to forget Tiger’s misdoings in the public eye, a history plagued with infidelity and reckless driving. After his high-profile scandals hit newsstands, Tiger’s good-guy image was tarnished. Longtime supporters, including AT&T, Gatorade, General Motors and Gillette, pulled all advertising featuring golf’s leading man, some completely severing ties with him. The ignominy, according to reports, cost sponsors upwards of $5 billion. One company stood by Tiger’s side through it all: Nike. Not without its fair share of controversy, Nike saw it was in its best interests to stick by its guy. In the past decade, Nike has warded off scandals of its own. The promotion of former NFL player Colin Kapernick, known for his decision to kneel during the national anthem, created a divisive conversation among the general public. Disgruntled Nike customers took to the streets, burning their Nike clothing and ripping the logo off their apparel. On the other hand, athletes such as LeBron James and Serena Williams praised Nike’s advertising campaign and the company’s contrarian position. The push led to an immediate drop in Nike’s stock price by 2.2%, but sales were up 27% in the days after the launch of the Kaepernick campaign, as compared to the previous year. Most recently, Nike took center court during the Duke University-University of North Carolina game. Less than a minute into the nationally televised contest, Duke star forward Zion Williamson fell to the ground with a left knee sprain, a result of his Nike shoe blowing out. Not only was the showcase player on Duke’s team injured, but Nike had to deal with the fallout of its product failing on a national level in a way that could have cost college basketball’s biggest star his future. Immediately, the Nike team went into action, traveling around the world to inspect the safety and production of its products and reinforce the performance standards for which they have always been known. Sunday was the opportunity for Tiger Woods and Nike to do right in the eyes of millions of Americans. After winning the Masters, Nike released a video on its social media channels featuring the golfer. The cameras followed Tiger as he embraced his family, amid the cheers all around him at Augusta, as well as those watching at home. 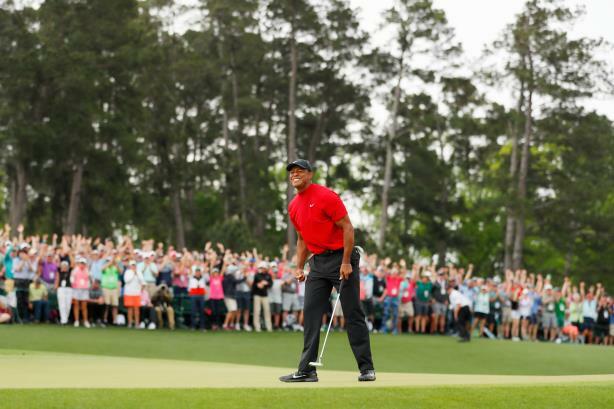 According to Apex Marketing, Tiger’s fifth Masters win was valued at roughly $22.5 million in exposure for the Nike brand. A look at the retailer’s website on Sunday showed that the majority of Tiger-branded apparel was sold out. Everyone loves a good comeback story. Sunday was the icing on the cake for Tiger and Nike. Every relationship has its ups and downs; it’s how you weather the storm that makes you stronger. On Sunday, Tiger and Nike both came out on top. Howe Burch is president of TBC Advertising and a former executive at Reebok and Fila.